“I won’t stop until I make 100 million pounds.” Christian Owens said once – a teenage boy, entrepreneur, who made his first million when he was just 16 years old. This is an amazing story about a British schoolboy, who now runs a multimillion company. 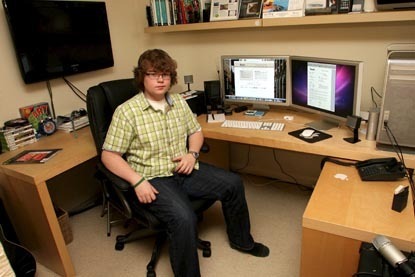 Christian Owens was just 14 when he started his first venture – the site Mac Box Bundle – an online store offering a combination of various Apple applications and utilities available for a short time at a big discount. He also gave 10 percent of the revenue to charity. The young entrepreneur used his pocket money to finance the business idea. The revenue from the portal was about 700 000 pounds for two years – from its start in 2008 to 2010. His inspiration came from other successful businesses like Apple Inc. and MacHeist. The kid said that his decision to go into business came after he examined the huge success achieved by Steve Jobs, Apple’s CEO. Initially, he worked during the evenings and in his spare time after he was ready with his school work. A year after the birth of his first business, he started another company – Branchr – a pay per click advertising network, co-founded with Mark Bao. It happened to be another big success, making a revenue of 500 000 pounds in the first year. The company now turns over more than 250 million ads to more than 10,000 sites every month and has bought a second company, Atomplan, which develops business software. In 2010 Owens started a new venture – VoteBundle, where potential customers could vote on what to be included in the bundles of Apple applications sold on his site. Christian invests most of the earnings back to his businesses. Currently, he has several employees much older than him. According to him, there is no magic formula for business success, what you need is determination, commitment and the desire to make something really great. That’s what helped him succeed. His aim now is to become a major name in the world of Internet business and to reach at least 100 million pounds of revenue. Christian still lives with mommy and dad – working class guys in Corby ( UK ), where his business office is. He says, that his business has not affected his personal life, and he still goes around with the kids from the neighborhood. They usually don’t talk about business and he is just a normal teenager to them. The young entrepreneur has been using a computer since he was 10 years old. This was the age, at which he started practicing web design and building sites.